The sleep specialists here at SleepDrops often talk to people just like you about the importance of having an easy nightly wind down routine. Soaking in a nice warm bath with magnesium bath salts is the ideal way to infuse your skin with this helpful mineral. These luxurious salts contain organic Lavender essential oil. When you open the pack and the delicious smell of real lavender hits your nose, thoughts of how relaxing your hot bath will encourage you to relax as quick as you can. Once in you can close your eyes and be surrounded by the lovely smells of lavender essential oil, all while soaking sore muscles and your body in a total state of relaxation. Magnesium sulphate is a naturally occurring mineral compound that is easily absorbed by the skin. Magnesium sulphate that has been shown to support stiff & weary muscles, calm the mind, soften skin and support relaxation. 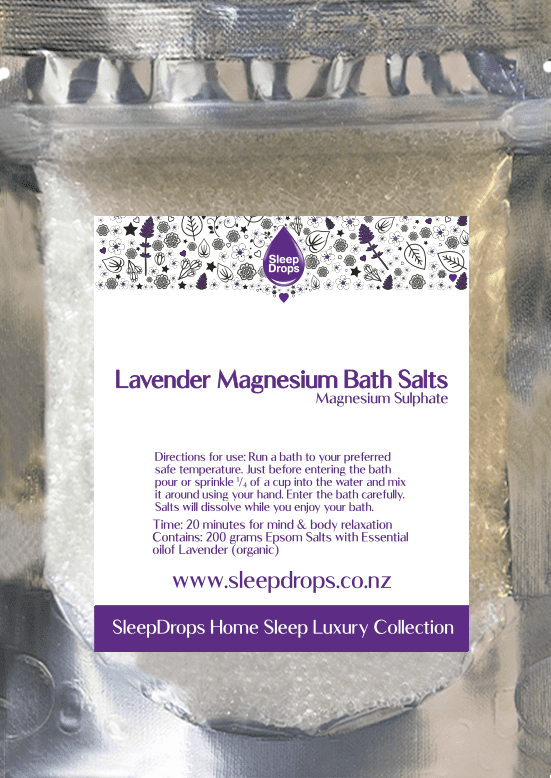 These beautiful Lavender Magnesium Bath Salts offer a luxurious night time ritual to help support a natural restful night sleep. Ingredients: Organic essential oil of Lavender, Magnesium sulphate.